After 2100 km and 21 hours drive we Johnny my doghandler, Herbert Bajer und his doghandler Muchi) arrived Zaragoza on the 16th of january. On the next day the handing out of the starting numbers and the official presentation of the participants took place. Subsequent to this presentation we drove to the accommodation for the stage in La Partacua. In fact of the lack of snow the organisation decided to host the prologue (it is the fixing of the starting order) on an other stage place. 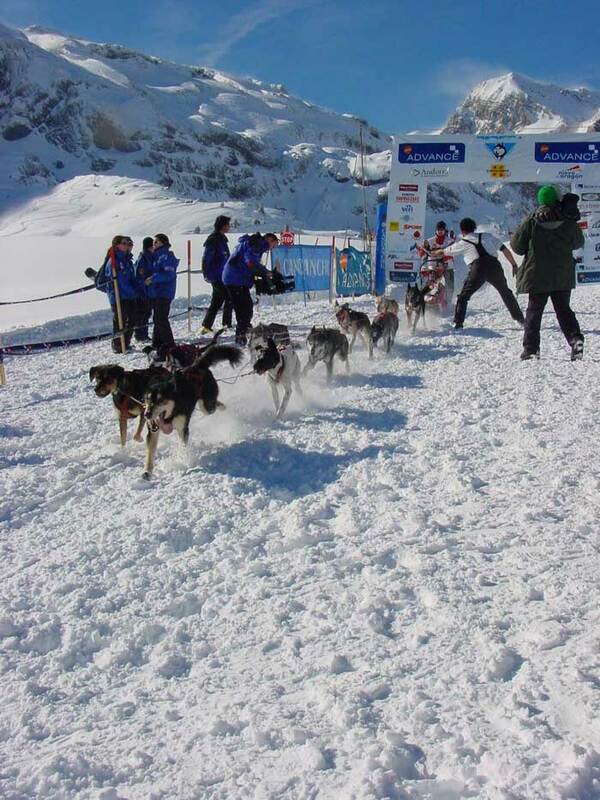 The prologue leaded over 5 km und it was limited of maximum 6 dogs. The planed first stage (a night stage) had to be canceled in fact of the worse snow conditions. The organisation decided shortly before to transfer the next two stages to Candanchu. In sunshine I went with 10 dogs on the start. The trail was very deep because of the fresh snow fall. Grischa, my 15 month old leader caused out of fear of the camera teams and the motor scooters two times a confusion (tangle). I finished the stage with the 4th position. Partly we run the same distance of the day before. At this stage I used other leaders who could not run such a high speed. I reached only the 9th position. In fact of strong fog and a very deep trail I decided to take the same leaders like the day before. I had the impression that my team had run in a perfect harmony but I only reached the 12th position, in the overall placing I fall back an the 10th position.
) had to be take along in the sledge. In spite of the strong fog I determined to take a fast leader to my main leading dog. I finished he night stage on the 6th position, in the overall placing I improved on the 8th position. From Montgarri we went on the early morning back again to Beret. In the Stakeout-area the mushers could hand over the equipment they don´t needed (only here the help of the handlers was permitted). 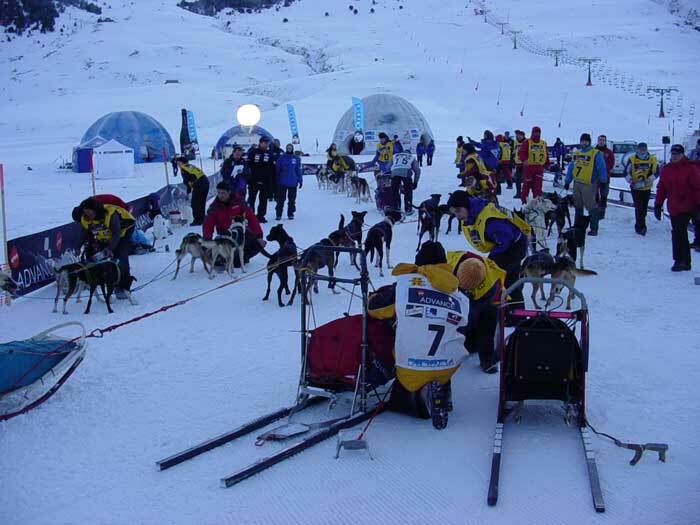 Without outsight help and during the time was running, the teams had to go on the trail to take up again the stage. The stage was the same like the day before but it was extended to Bonabe. From 2000 meters we went down to Bonabe up to 1500 meters. Arrived in Bonabe we had to drive a loop and then we had to go back again. The fact that the trail passed again the place for the night some teams had great problems to drive to Beret to the finish. I was very impressed of the great performance of my team and I finished this stage on the 3rd position. We get caught in the rain and the trail was therefore very deep. In fact of this bad weather conditions one part of the trail had to be copes with an head on passing. Afterwards it went up to Pic de L'Orri up to 2400 meters. I reached the 4th position und I hold in the overall placing the 5th position. The trail had to be changed because the weather conditions have been very bad and therefore the part with the head on passing was canceled. I finished 3rd. The stage was about 7,5 km and we had to drive it for two times und I finished again on the 3rd position. The fog was partly so strong that I even could see my leaders. The planed bivac was canceld because of the snow flurry (the cancellation of the bivac was a great pleasure for all mushers). I finished the night stage on the 5th position. We had to drive the same trail like the evening before. The weather was very good, we had sunshine and the trail was perfect. 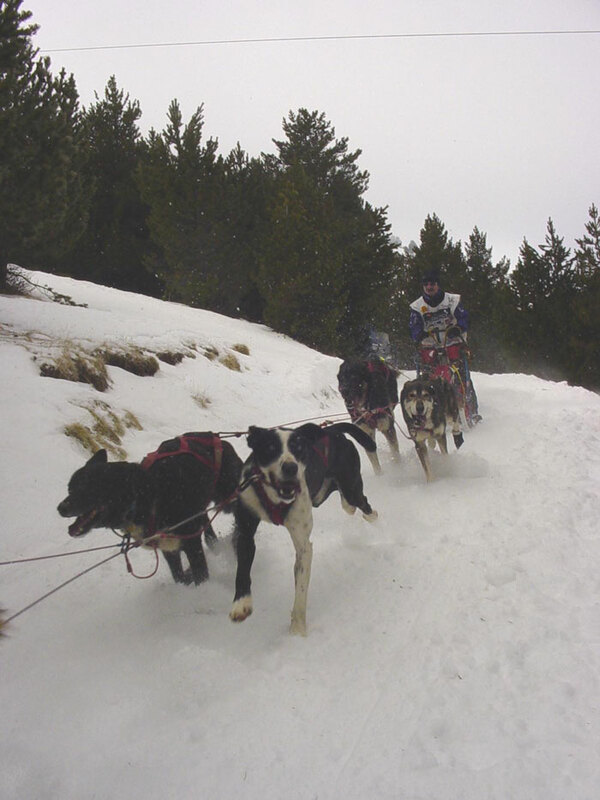 Unfortunately I had to take y main leader in the sled because he could not go the tempo of the team. I reached the 4th position. From Soldeu el Tarter we went up to Grau Roig from 1700 meters up to 2100 meters. This stage was limited of 8 dogs . The first part of this stage had very steep inclines. The remaining part of the stage was the trail of Grau Roig. I reached the 8th position, in the overall placing it was the 5th position. This stage was the steepest of all stages we had on this Pirena. Unfortunately I went out with only 8 dogs. I lost my eye glasses and in fact of the strong wind and therefore blinded with tears I head frozen my corneas. I could not see anything and I had to rely on my dogs, therefore I finished this stage unfortunately only on the 19th position. We had very good weather conditions and we went up to the highest point of this years Pirena up to 2580 meters. 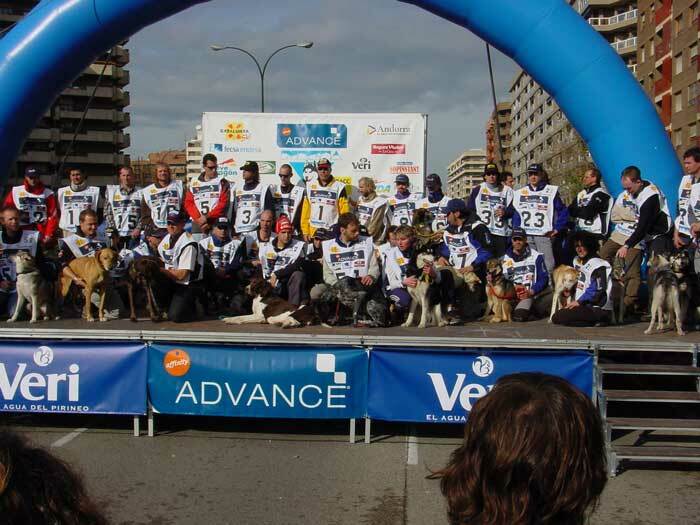 This stage had to take place because of the very great crowd of spectators and was limited of 6 dogs. Afterwards the honouring of all mushers and doghandlers who finished this years Pirena started. In the overall placing I finished this Pirena on the 5th position. In the evening the honouring of the best three of every category (Skijöring, pure breed an open class) took place. 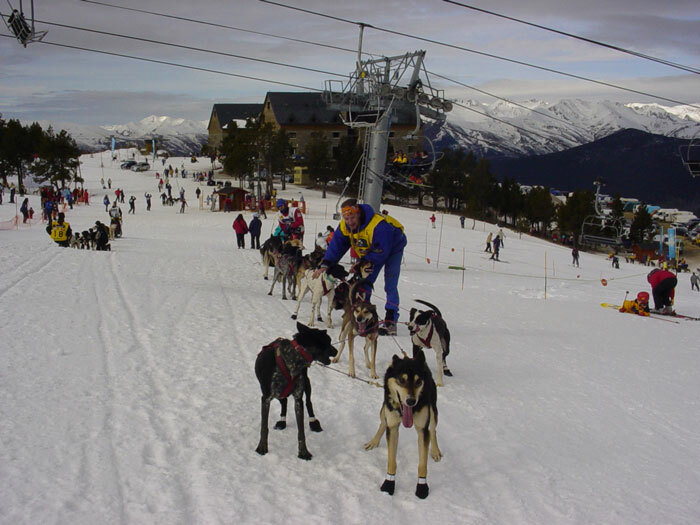 I became a special price in fact of the very good treatment of my dogs during this race. The firework was extraordinary an the ceremony a very great event. Rudi Ropertz, who had provided me with two dogs , which had completed my team very good and contributed to my success. Reinhard Monschein from whom I have also two excellent dogs in my team. Johnny, who had this year his first season as doghandler had made an excellent work.